Community pharmacies are ideally located as a source of support for people with chronic conditions. Yet, we have limited insight into what innovative pharmacy services would support this consumer group to manage their condition/s. The aim of this study was to identify what innovations people with chronic conditions and their carers want from their ideal community pharmacy, and compare with what pharmacists and pharmacy support staff think consumers want. We elicited ideas using the nominal group technique. Participants included people with chronic conditions, unpaid carers, pharmacists and pharmacy support staff, in four regions of Australia. Themes were identified via thematic analysis using the constant comparison method. Fifteen consumer/carer, four pharmacist and two pharmacy support staff groups were conducted. Two overarching themes were identified: extended scope of practice for the pharmacist and new or improved pharmacy services. The most innovative role for Australian pharmacists was medication continuance, within a limited time-frame. Consumers and carers wanted improved access to pharmacists, but this did not necessarily align with a faster or automated dispensing service. Other ideas included streamlined access to prescriptions via medication reminders, electronic prescriptions and a chronic illness card. This study provides further support for extending the pharmacist’s role in medication continuance, particularly as it represents the consumer’s voice. How this is done, or the methods used, needs to optimise patient safety. A range of innovative strategies were proposed and Australian community pharmacies should advocate for and implement innovative approaches to improve access and ensure continuity of care. Similar to other countries, chronic conditions present an increasing burden in Australia . As medication is generally needed to treat chronic conditions, pharmacists can provide further support in this area. Certainly, the Pharmaceutical Society of Australia’s (PSA) ‘Call to Action on Chronic Disease’ comes at a most opportune time. The call is for pharmacists to expand their scope of services, thus realising their full potential to assist people with chronic conditions. While the provision of professional pharmacy services in Australia has increased, more needs to be done in preventative care, and to improve the health of people with a chronic condition . Unpaid carers play an integral role in supporting people with chronic conditions. There are over 2.7 million carers in Australia, representing approximately 11.9% of the population . This role could include managing the medication of the person they care for , hence carers are likely to interact with community pharmacy staff. Further insight is needed as to how community pharmacy can support carers, and subsequently, better assist the care receiver. In order to be effective, healthcare services need to be of value to the end user; therefore, people with chronic conditions need to have more prominence in research . This raises the question as to what pharmacy services do people want from community pharmacy to support them in managing their chronic condition/s. This is a particularly important question with respect to innovative pharmacy services, i.e. the introduction of a new service or approach in pharmacy . In the context of this study, innovation was further defined to include the extension of the community pharmacist’s current role/s or services. Internationally, there have been significant changes to the pharmacist’s role and the services that community pharmacies can provide. This includes the provision of public health services , minor ailments schemes , pharmacist-administered vaccinations  and prescribing . While there has been significant dialogue about extending the roles of Australian pharmacists , this has not eventuated into practice. There has been, however, research as to whether Australian residents actually want the types of services described above. Hoti et al. conducted one of two studies that explored the public’s view of pharmacist prescribing [12, 13], with the majority of participants accepting this expanded role within the community pharmacy setting. Although all study participants were regular pharmacy users and used at least one prescription medication, whether carers were involved and the proportion of participants living in a rural area was unclear . This is important information, as people with chronic conditions are likely to have different experiences and needs to those who are carers. Differences would also be expected between urban and rural residents as healthcare access can differ depending on one’s location in Australia. Furthermore, is innovation at the community pharmacy level driven by a clear understanding by pharmacy staff, i.e. pharmacists and pharmacy support staff, of what consumers/carers want? There is a need to explore this further; there is limited knowledge as to what community pharmacy staff believe people with chronic conditions and their carers want pharmacy to provide. If there are incongruent views between consumers, carers and pharmacy staff, differences will need to be explored further to ensure that pharmacy staff meet their consumers’ needs. This study aims to identify what innovations people with chronic conditions and their carers want from their ideal community pharmacy, and compare this with what pharmacy staff think consumers want community pharmacy to provide. Consumer participants with one or more chronic condition/s, or an unpaid carer for such a person, were purposively sampled , from four Australian regions; Mount Isa and Logan-Beaudesert (Queensland), Northern Rivers (New South Wales) and Perth (Western Australia). These areas vary in terms of accessibility to pharmacies, i.e. from being highly accessible in Perth, to modestly or remotely accessible in Mount Isa . Participation included individuals from culturally and linguistically diverse populations (CALD) and Aboriginal or Torres Strait Islander peoples (IND). The health professional groups consisted of either pharmacists or pharmacy support staff; pharmacy assistants were included as they are generally the first point of contact for consumers [16, 17]. It was preferable that pharmacists were currently employed, or had recent experience in the community pharmacy setting. This ensured that pharmacists had up to date knowledge of community pharmacy practice, and were therefore better placed to answer the research question. Recruitement for all participants involved snowball sampling  and dissemination of information to consumer health groups, professional organisations, and community pharmacies located within the study areas. The nominal group technique [18, 19], a highly structured process which facilitates the generation, discussion and ranking of participant ideas  (Figure 1), was used to elicit and compare opinions and priorities between consumers, carers and pharmacy staff [20, 21]. Participants were asked to imagine their local pharmacy several years into the future: what services could they offer to help them to meet their individual health goals, or to best support them in their role as a carer? To enable a direct comparison with the priorities of people with chronic conditions and their carers, pharmacy staff were directed to reflect on what they think their consumers would want, not what they would personally want. Adapted version of Nominal Group Technique that is relevant to this study. Groups were conducted between December 2012 and April 2013, audio-recorded and transcribed verbatim. Three facilitators were deemed necessary to conduct the nominal groups effectively , and these roles were undertaken by three researchers of varying professional backgrounds, e.g. public health and pharmacy, as well as a consumer researcher. Informed consent was obtained from all participants prior to conducting the nominal groups. Griffith University Human Research Ethics Committee (PHM/12/11/HREC) provided study approval. A ranked list of priorities, i.e. 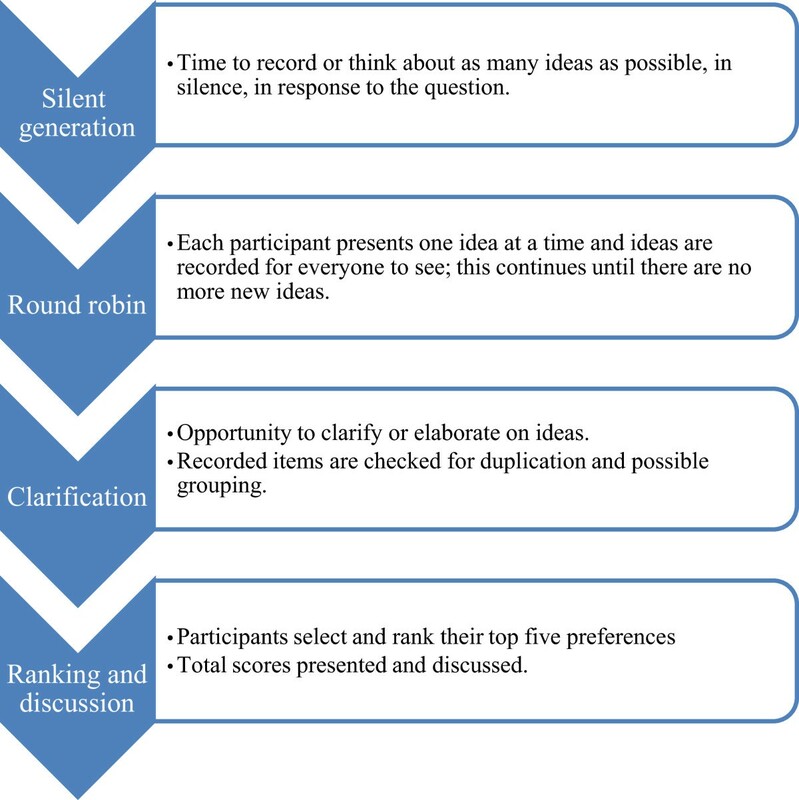 ideas, generated from the ranking/discussion stage of each group (Figure 1) was reviewed to develop an initial analysis framework. This framework was discussed between four researchers who primarily facilitated the groups, with 23 themes condensed into 12 over-arching themes . This final framework was then used to assist both qualitative and quantitative analysis, of which the latter process is detailed elsewhere . All transcripts were analysed, via the framework, using the constant comparison method  and NVIVO.© This paper reports the qualitative data relevant to innovative services and roles, one of the 12 themes identified. Individuals participated in 15 consumer/carer groups (n = 103), two pharmacy support staff and four pharmacist groups (n = 35; Table 1). Participant numbers averaged six to seven per group (range, 2–14 people). Two over-arching themes were identified in relation to innovation; extended scope of practice for the pharmacist, i.e. new roles, and providing new or improved existing pharmacy services, i.e. increased access to the pharmacist and other healthcare professionals, medications, and information (Table 2). Additional quotes are provided in Table 3.
n = total number of participants per group type. *4 CALD participants participated in mixed consumer/carer group. #2 CALD participants participated in one of the consumer groups. Conversely, pharmacists diverged slightly from this view in relation to nurse-administered vaccinations, with discussion of the pharmacist conducting this role. Obtaining specialist referrals from the community pharmacist was also viewed as a way to improve healthcare access. This idea was also raised by an Aboriginal or Torres Strait Islander group, with participants describing what the card would incorporate, including their photo and medical history, known allergies, doctor/s details, and to be linked to preventative articles and information about their condition/s. These participants also thought it would be particularly useful for elders, especially when they travel or go ‘walkabout.’ Another participant wanted to have the medication indication listed on the prescription. This study strengthens support for Australian pharmacists to expand their scope of practice to include continued supply of repeat prescriptions. This was described in numerous ways by participants, with terminology including prescription renewal and prescribing. However, regardless of the terminology used, the end result was the same, i.e. that consumers and carers wanted to obtain a continual supply of the medication they regularly use, from their pharmacy, without having to go back to the doctor for a repeat prescription. Furthermore, pharmacist support staff and pharmacist groups also thought that consumers and carers would want this extended pharmacist role; they were correct in their assumptions. ‘Continued dispensing’ for one standard pack of statins and oral contraceptive pills only (e.g. 28 day supply). This is a relatively new arrangement in some Australian states and territories. However, despite the above provisions, this study suggests that people with chronic conditions and carers are still having problems obtaining their prescription medication/s. This issue is linked with the inconsistencies in quantity and repeat prescription allowances for medicines for chronic conditions, i.e. 28 to 200 days’ supply, and zero to eleven repeats. Consequently, consumers can have difficulty synchronising their medications in terms of needing a new supply or prescription, particularly if they are taking numerous medications with different quantities and repeats. Furthermore, a pharmacist group described that, because of the limited GP appointments available in their rural area, consumers were being charged for a new (repeat) prescription without seeing their GP. Consumers and carers were frustrated with being unable to get a GP appointment in time, or being charged a fee just to pick up new prescriptions. While this study did not explore the experiences of our participants during their GP consultations, it is evident that consumers and carers wanted a more convenient system by involving the community pharmacist in prescription reminders and in the continual supply of their medication. Groups also raised the issue of obtaining additional medication without a prescription when consumers had run out. While legislation permits the supply of up to three days’ medication or a single standard pack if the pack cannot be broken, e.g. cream, or eye drops, the supply of greater quantities without a prescription is illegal [25–27]. Our findings indicate that consumers and carers could not understand why larger quantities, e.g. their usual prescription, could not be supplied before the prescription had been received by the pharmacist, especially when the pharmacist was aware of their history and need for the medication. Ultimately, the prescription supply system could be made safer and more accessible to people by extending the continued dispensing legislation for pharmacists . Pharmacists would then be freed from the conflict between acting within the law and acting in the patient's best interest. It would also align with Australia’s National Medicines Policy for more timely access to medicines , especially in rural and remote areas where time and travel are often barriers to obtaining healthcare . Continued medication supply, if conducted appropriately, and collaboratively with GPs, could allow for more consumer contact with the pharmacist; something that participants wanted in this study. This study cannot provide details with respect to ‘how’ pharmacists could provide a continued supply of medication to people with chronic conditions. However, an example of pharmacists working collaboratively with doctors to assist with medication continuance, and improve patient convenience, is demonstrated by the Pharmacy Anti-coagulation Management Services in New Zealand . Pharmacists can monitor therapy, review results and provide dose changes under a GP standing order; prescribing rights are retained by the GP . Healthcare policy makers and professional pharmacy bodies should consider two recent Australian reports documenting the movement towards ‘non-medical prescribing’ for pharmacists [33, 34], a move seen internationally with supplementary prescribing [35, 36]. Our findings align with aspects of supplementary prescribing, i.e. that a pharmacist prescribes in accordance to a clinical management plan, by continuing medication that has been approved by the patient’s medical prescriber . There were differences in opinions between consumer, carer and health professional groups. Pharmacy staff overvalued the importance of rapid dispensing. Generally, consumer and carer groups did not want innovative dispensing machines; they wanted improved access to the pharmacist via new services, such as online, virtual pharmacy consultations and home visits. Although there are tele-health services in Australia, eligible healthcare providers require a Medicare provider number, which pharmacists currently cannot obtain . Similar issues exist with home visits or follow-ups; pharmacists can only obtain re-imbursement if conducting a home medication review, or alternatively, charge the patient as a privately funded service. Participants also sought streamlined prescription access via extending services that some pharmacies may already provide (i.e. improved services), such as medication or prescription reminders, and electronic prescriptions, as well as the introduction of a chronic illness card containing their medical history. Consumers and carers also wanted easier access to a range of other healthcare professionals, with some commenting on having a ‘one-stop shop’, similar to a medical hub. However, this was described as more for the purposes of convenience . Pharmacy assistants, not pharmacists, were more forthcoming with this idea. This paper relies on self-reported data and does not present the quantitative (i.e. priority lists) results from the nominal groups. The majority of groups were conducted during working hours and may not be representative of people who work or have caring commitments in the day, e.g. parents. No specific information about the characteristics of the pharmacy that participants either used or worked in was sought. However, the nominal group method did allow people to talk about their experiences, giving participants an equal say in terms of responding to the question. Furthermore, this technique allows for the generation of more than one single idea, i.e. ideas are maximised and exhausted in each group. As the facilitators were not independent of the research, there was a risk of investigator-bias. However, this was done to facilitate the complex analysis process undertaken by the team . Furthermore, the methodology used (i.e. nominal group technique) minimises the influences of the researcher , and a consumer researcher was involved to ground the findings in consumer experiences. Consumers and carers supported extending the role of the community pharmacist to include continued medication supply. Furthermore, this was one idea where views between the different groups, i.e. consumer, carer and pharmacy staff, were aligned. Continued medication supply could be via repeat prescribing or other management services, whichever method optimises patient safety. Pharmacists need to be aware that their consumers do not necessarily want a speedier, automated dispensing service, but seek greater access to them as a healthcare professional. Consequently, Australian community pharmacists and the pharmacy profession should consider these findings, given that they are what people with chronic conditions and carers want from their ideal pharmacy. This project is funded by the Australian Government Department of Health as part of the Fifth Community Pharmacy Agreement Research and Development Program managed by The Pharmacy Guild of Australia. The financial assistance provided must not be taken as endorsement of the contents of this study. We acknowledge the assistance of Professor Elizabeth Kendall for her advice and consultation, and Beth Hunter, Rhonda Knights and Claire Campbell for their help with participant recruitment and data collection. We thank all participants who undertook the nominal group process or assisted in their organisation, as well as the manuscript reviewer for their feedback. FK, MK, JW and AJ participated in the design of the main study, SM, AS and FK were involved in designing and facilitating the nominal groups, SM, AS, FK analysed the data, SM drafted the manuscript and all authors provided editorial comments. All authors read and approved the final manuscript. Australian Bureau of Statistics: 4430.0 - Disability, Ageing and Carers, Australia: Summary of Findings, 2012. http://www.abs.gov.au/ausstats/abs@.nsf/mf/4430.0. The Pharmacy Guild of Australia: The roadmap: the strategic direction for community pharmacy. http://www.guild.org.au/docs/default-source/public-documents/tab---the-guild/Strategic-Direction/here-.pdf?sfvrsn=0. Australian Government Department of Health and Ageing: The national medicines policy document. http://www.health.gov.au/internet/main/publishing.nsf/Content/national-medicines-policy. Shaw J, Harrison J, Harrison J: Community pharmacist-led anticoagulation management service final report. http://www.centraltas.co.nz/LinkClick.aspx?fileticket=B9rFT2EvcF8%3D&tabid=278&mid=1312. Duckett S, Breadon P: Access all areas: new solutions for GP shortages in rural Australia. http://grattan.edu.au/report/access-all-areas-new-solutions-for-gp-shortages-in-rural-australia/.